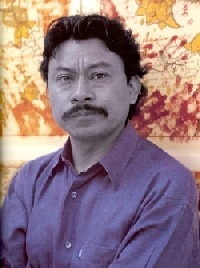 Born in Huajuapan de Leon, Oaxaca in 1957. In 1973 and 1974 he studied at the Escuela Nacional de Artes Plasticas of the Universidad Nacional Autonoma de Mexico and from 1975 until 1980 at the Escuela de Pintura y Escultura La Esmeralda of the Fine Arts Institute of Mexico. He has achieved recognition in the fields of painting, sculpture, and graphic arts. His first solo exhibition was held in 1980 in Mexico City. Since then he has also had solo-shows in France and the US. In 1985 he presented his work at the XVIII International Biennale in Sao Paolo Brazil and in 1987 at the Centro Cultural de Mexico in Paris, France. His work has traveled the world in collective exhibitions held in Sweden, Germany, Japan, France, Mexico and the US. In 1983 he took part at the III Iberoamerican Biennale at the Carrillo Gil Museum and a year after at the I Biennale in Havana, Cuba. Among the awards and distinctions that he has received are the Honorable Mention at the Iberoamerican Biennale and the Acquisition Award from the Salon de Pintura and the Salon de Dibujo of the Fine Arts Institute of Mexico.